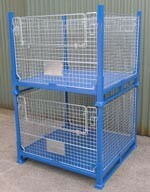 The MMC-01 cage can be transported by forklift or pallet trolley and can be stacked 2 high when fully loaded making this cage suitable for racking or stand alone applications. Front and rear panels are removable. Powder coated frame / zinc plated insert panels.